Team driving already offers the highest earning potential in Schneider’s fleet, and we’re proud to announce several upgrades to enhance the Team driving experience. Schneider continually evaluates driver pay, so we frequently raise it. The next Van Truckload driver pay increase for solo and Team drivers takes effect May 20, 2018. Exact amounts will vary by market and experience level, but it’s on the heels of multiple other increases over the last year. How much do Team truck drivers make in a year? That’s $11,900 over the industry average for Team Over-the-Road drivers, and $20,000 over the industry average for solo Over-the-Road drivers (according to Wanted Analytics). Earning potential will vary for Team drivers in other lines of business (different Dedicated accounts, for example), but Teams consistently achieve higher earning potential than solos. Team-Exclusive Tuition Reimbursement Increase — Limited Time! Recent truck driving school graduates interested in Team driving will now get reimbursed $400 per month (solos get $200/month) for up to $7,000 in driving school expenses. Teams pay off driving school faster! This offer is available through Aug. 31, 2018. Schneider has added a recruiter to help Team driving applicants who come without a partner, to find a partner more quickly, ideally before orientation class even starts. Fill out the Team Matching Form. We search for a match in our database. If it’s a good fit, that’s it! Team sign-on bonus up to $30,000 — limited time! 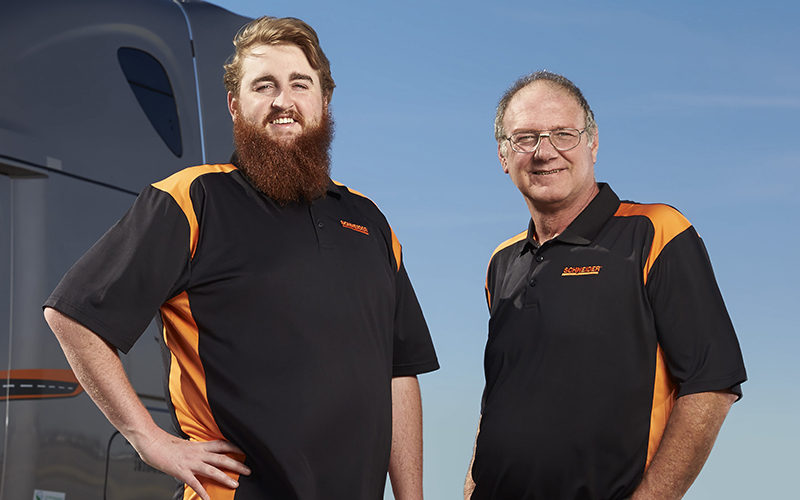 Customers continue to ask Schneider for Team drivers to haul their high-priority freight, so opportunity is abundant for spouses, siblings, family, friends, driving school graduates and other partners who are looking for a unique opportunity with a big-time reward. Please consider joining the Schneider Team today. Do you have any questions about Team driving at Schneider? Comment below, and we’d be happy to help! What is life like as a Schneider Team truck driver?